The Kelowna Chamber of Commerce is honoured to be involved in the celebration of exceptional businesses within our community. 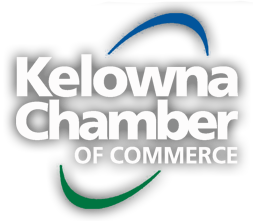 Since its inception in 1987, the Business Excellence Awards has presented over 250 awards to businesses in Kelowna and the surrounding area. This program offers finalists and award recipients well-deserved recognition for their accomplishments as well as valuable publicity for their organization. The award and overall experience really helped our business to stand out in the community. Winning gave us the opportunity to have 4 minutes of spotlight on just us, in front of 350 business people. It was such a valuable experience. Thank you Kelowna Chamber of Commerce. For sponsorship opportunities, contact our Sales & Business Development Manager. Marketing Campaign of the Year: SK Form & Finish Inc.
Young Entrepreneur Award: Chris & Addie Pafiolis/Sweetlegs Clothing Inc.
Micro Business of the Year: Hatch Interior Design Inc.
Small Business of the Year: Faction Projects Inc.
Mid-size Business of the Year: Highstreet Ventures Inc.
Large Business of the Year: Strategic Aviation Services Ltd.
Dr. Harmony Mir/Harmony Chiropractic Clinic Inc.
Chris & Addie Pafiolis/SweetLegs Clothing Inc.
Pacific Quorum (Okanagan) Properties Inc.
Brandi & Brent Watson | Vision Mechanical Ltd.
Dr. Harmony Mir | Harmony Chiropractic Clinic Inc.
Chris & Addie Pafiolis | SweetLegs Clothing Inc.
Nicole Pidherny | Pomme Salon Inc.
Ranjit Takhar | Evergreen Building Maintenance Inc.
Steve Cowburn | Perfit Dental Solutions Inc.
Stuart McFadden | McFadden Managment Ltd.
Small Business of the Year (1-10 employees) Highstreet Ventures Inc.
Young Entrepreneur of the Year Rachel Clarida of Hatch Interior Design Inc.
Sustainability Award Evergreen Building Maintenance Inc.
Mid-size Business of the Year (16-50 employees) SK Form & Finish Inc. Rising Star Business of the Year Cottage Quilting Ltd. Marketer of the Year Martketer Inc.